In this New York Timesbestseller, T.D. Jakes uses inspiration from the Lord's Prayer to reveal how the act of forgivingand learning to be forgivencan lead you to a more joyful, peaceful, and purposeful life. Forgive and forget. It should be easy to doso why don't we do it? The father who wasn't always there for us. The mother who punished us. The spouse who betrayed us. The children who will leave us behind. Whoever and whatever the source of hurt, there is always a path to forgiveness. But too often, instead of forgiving, too many of us live with resentments and grudges that keep us stuck, robbing our days of joy, peace, and purpose. 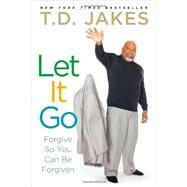 In Let It Go, bestselling author and pastor to a flock of millions T.D. Jakes shares the wisdom and guidance necessary to release a lifetime of hurt and anger and move on with the joyful business of living. Revealing the essential secrets to leading an emotionally vital and spiritually healthy life, Jakes gently teaches the art of forgiveness as a daily practice. In order to practice forgiveness, he explains, we must first learn new styles of conflict resolution and new forms of anger management. To that end, he shows us how to recognize offenses when they come, establish boundaries, encourage purity of heart, develop trust, recover from hurts faster, and forgive ourselves for the rest of our lives. As unconditionally loved children of God, he attests, we are all forgiven. Through grace, we can forgive ourselves and the people around us. In this way, says Jakes, we can live the happy and fulfilled life intended for us. I have a confession to make and want you to hear it straight from me. It’s about someone I love.I am a lover of people who have big ideas!I love the way they envision the world as an expansive landscape of ever-growing possibilities. What others see as insurmountable mountains or treacherous waters, they view as giant-sized opportunities and limitless horizons. I love to hear them talk because through them my own ideas are watered and fertilized by my exposure to their way of thinking. You see, I believe that one’s speech is largely a result of his or her perspective. Generally, people’s perspectives are born from the height in which they think. Let me give you a very literal example. When my wife and I would hide our children’s Christmas presents, I noticed an amusing propensity each of us had to hide the toys according to our respective heights. My wife hardly ever hid a present up high, keeping it within her arm’s reach. Compared to me, she is relatively short in stature. So when she hid things, she always secured them in low places. I, conversely, hid the kids’ toys in the top of the closet or in an air duct in the ceiling because my viewpoint reflected my height. My wife was not opposed to hiding them in high places; she simply didn’t think to place them beyond her eye level. Her ideas were a reflection of her height. For the past three hundred years, our country has largely been a big-idea nation. If you were to go back three centuries, a relatively short period in the history of the world, you would see that most of the modern conveniences we enjoy, like air travel, electricity, railroads, and automobiles, have only been in existence within the last one hundred years. Prior to the twentieth century, there were no computers, microwave ovens, no cell phones, car phones, or telephones at all. There were no engines, steam, gas, or electric motors. No indoor plumbing. No medical options like vaccinations, anesthesia, or chemotherapy. No major surgeries, such as heart replacements or kidney transplants. No stem cell research. When one considers how long man has been in existence, the notion that most of the conveniences common to our present way of life only emerged in the past couple of centuries seems truly amazing. Their creation reveals that the last few generations have largely been the catalyst through which big ideas exploded and were massively produced. Our country has thrived and become the envy of other nations because we have, for several generations, been a nation of big ideas. Big ideas come from forward-thinking people who challenge the norm, think outside the box, and invent the world they see inside rather than submitting to the limitations of current dilemmas. Now, you might be scratching your head and saying, “What’s he talking about? I thought this was a book about letting go of the past and finding the grace to forgive! Why is he going on and on about big ideas?” I am glad you asked. You see, much like turbo jets, fighter planes, the Internet, brain surgery, or stem cell research, forgiveness is a big idea. It takes a person who thinks big ideas rather than comparatively small thoughts to introduce and practice forgiveness effectively. Would you agree? Let’s see if we can drill down into this notion to test its validity. Several years ago I was invited as a guest onOprahto talk about sexual abuse. When I suggested that it is important that we move beyond just saying how bad the molester was to have committed such atrocious acts, to the larger (from my viewpoint) idea of showing the perpetrator how he can be forgiven and rehabilitated, people went wild. Some of the guests were far too angry to think beyond the height of the atrocities they had experienced. They used their anger like familiar blankets to warm them as a comfort from their trauma, never realizing how they were smothering their own futures. They couldn’t imagine that future perpetrators will never come forward as long as they believe they have no chance at forgiveness and rehabilitation. While the women who told their stories that day on the show had every justifiable reason to hate and be angry, the reality is the poison of unquenched anger doesn’t infect the perpetrator but only incarcerates the victim. Unforgiveness denies the victim the possibility of parole and leaves them stuck in the prison of what was, incarcerating them in their trauma and relinquishing the chance to escape beyond the pain. We have seen this truth about forgiveness played out on a larger scale. When angry, bruised women from South Africa screamed in outrage because of the horrible atrocities they had been exposed to from apartheid, Nelson Mandela and members of the African National Congress (ANC) knew that a small idea like revenge would destroy the far larger idea of national healing and survival for their country. If they focused only on the temporary desire for immediate justice and swift retribution and missed the far weightier need for a healthy, functional, inclusive government in the midst of a nation filled with the pain of its most recent maladies, their homeland would never have survived. The National Council of Provinces (NCOP) was developed to raise the bar by giving diplomatic immunity to sometimes undeserving people in order to protect the larger necessity of national survival. The big idea was forgiveness; the smaller idea, as justifiable as it might’ve been, was hatred, resentment, and revenge. South Africa survived because those at the helm chose the bigger idea of the good for all rather than the revenge of some. When Dr. King resisted the lure of his own anger and submitted to the larger idea of a nonviolent movement that was led and filled with justifiably angry people, he preserved the future and changed our world. Those with the smaller ideas of starting our own country, or shooting and killing the racist molesters who had abused our fathers and raped our mothers, would have appeased our human need for retribution while destroying our way of life. We survived because we dared to risk acting on the larger notion of forgiveness rather than acquiesce to the dwarfed ideas of revenge and retaliation. Consequently, the destruction that would have been the inevitable result of thinking too small was eclipsed by the hopes of men and women who dared to dream on a scale larger than they had ever seen. Like Native Americans relegated to a reservation where one could only be the chief of a small, government-sanctioned area, many of us remain on the reservation rather than escaping into the much larger world of assimilation, inclusion, and acceptance. Simply stated, people who don’t forgive neutralize their own growth potential. They end up hopelessly entrapped by the repercussions of leadership that remains in a dwarfed context of thought, thereby missing the overarching need to transcend the immediate encumbrance. We must think beyond the reservation like so many Native Americans have done and move forward. When I write on blogs and Facebook, I am often astonished at Christians who never leave the reservation and can only see or think from their own Christian perspective rather than evaluating others from a broader perspective of overall ability. They sacrifice an excellent leader because he isn’t a Christian as they define it or limit the discussion to one or two issues at the expense of the bigger idea of how well a leader can lead the country. I shocked my church when I announced that I was far more interested in finding a surgeon who was great at operating than I was finding one who voted like I did on political issues or shared my ideas on faith. I explained to them that I’m more concerned about a surgeon’s track record in the arena of patient recovery success than I’m interested in interrogating him on his view of eschatological theology! I just want to know if he can do the job, not whether he teaches Sunday school at First Baptist! On an operating table we can sacrifice the dwarfed idea of our personal theological perspectives for the bigger idea of doctor’s surgical competency. When we can have both, it’s a real advantage. But I will not refuse the services of an excellent surgeon just because I don’t like his favorite football team—or his religion! When looking at this model of thinking in our personal lives we must ask ourselves the question, does incarcerating the perpetrator to a lifelong sentence with no hope of parole really protect us from the ever-increasing chances of attack by unknown stalkers? My fear is that it only perpetuates a pathology that teaches our children that we are too irrational a society to allow people to grow beyond what they did into what they can become. Consequently, perpetrators have no choice but to hide who they are and therefore continue to attack our children, destroy their marital vows, or engage in disputes once mistakes are made. A healthy family environment is only achieved when one leaves the night-light on for those who have wandered away. We must be willing to give them what we all need, a GPS system that allows the prodigal son to find the way back when he is finally ready to return home. I have learned that most people who harbor animosity in their hearts against others do so because they remain on the reservation of what has happened in the past rather to escape to the much larger idea of a better future. However, they must ask themselves, What will happen if I cling to my narrow perspective and lose a chance to loose change in my life? How can I move beyond my history into the larger terrain of my destiny? Yes, ladies and gentlemen, forgiveness is a big idea and it works best when it is invested into people who have the courage to grasp the seven-foot-high idea of what’s best for their future rather than the four-foot-high idea of recompense for what has happened in their past. I’m here to encourage you to cut the chain-link fence that prevents you from moving ahead by using the torch of big ideas to cut through the metal of a painful past. I suggest to you that forgiving the minor to protect the major is not only how civilizations survive, it’s how individuals thrive! You see, unforgiveness is a small sphere of operation. It exists among people who cannot escape what was for what is. The family that cannot forgive its members of poor past judgments will not easily survive. The child who is constantly assaulted by the relentless attacker castigating them for the foolish things they did yesterday will inevitably shrink, wither, and die, never becoming what he could have been had someone extended the nutrition of forgiveness. No, we must allow him to see that there is more to be considered before you than the total weight of all the mistakes left behind you. This truth extends beyond the personal to the professional arena. With the exception of a few notable people who have continued to give us big ideas in the twenty-first century, today we mostly see tiny ideas camouflaged by slick, glossy advertising spin to try and hypnotize us into thinking this dwarf fits the stature of a big idea! Successful businesses must be constantly infused with big thinkers or they will quickly become obsolete and insolvent. If smaller businesses can’t embrace change and adapt, then they will soon be taken over by bigger conglomerates that can move beyond the mom-and-pop stream into the ocean of higher-level thinking and consciousness. Big ideas are only extracted from the heart of big people who think beyond the breach and embrace the potential of the future. All of us are capable of big ideas and giant advancement, but we rarely experience the liberation of such large thinking. Unbeknownst to most of us, unforgiveness incarcerates us but never rehabilitates, and soon the warden of destruction becomes the coroner of death to our dreams, our hearts, and our hopes. When we do not embrace forgiveness as the key to our freedom, our little ideas will always poison our bigger opportunities for new thought, honest dialogue, and solution-oriented discussion. The clarion call we get from God himself to forgive is a daunting challenge at best and will never be accomplished by those who will not forsake the comfort of anger for the challenge of moving ahead. As daunting as the talk may be, if we are to enjoy a brighter tomorrow, we must rid ourselves of the grave clothes of where we have been and stitch a newer garment of where we are growing. If you are a Christian reading this, you will likely remember that Jesus folded his death garments and appeared in the garden in bright apparel with no trace of where he had been lingering on him. Mary didn’t even recognize Jesus, even though she knew him well, because he had moved to a new place of power, purpose, and peace. She was expecting him to look like and think like where he had been as opposed to where he was now! Your past life is too small to fit you as you grow into the fullness of all you were meant to be. It’s like wearing your sixth-grade band uniform to a symphony concert at Carnegie Hall! The garment is too small for where you are and where you are going, and to hold on to it is an expression of your constant need to see all things from the small perspective of a past experience. Our nation and all nations who have enjoyed freedom did so only when they listened to a bigger idea than where they were at the time. If that is true for us as a civilization, it is also true of us as individuals. We are dwarfed down by the small pettiness of yesterday thinkers when what we really need can only come from those who think in an enlarged state of unleashed imagination! Are you ready to change clothes? It is my hope as we embrace the challenges of higher-level thinking that we will inevitably, both as a society and more attainably as individuals, evolve beyond the dwarfed ideas that leave us captive to what was. It is my hope that those who think at an altitude beyond attitudes will find nourishment from this book to move far beyond pettiness into the powerful terrain of seven-foot-tall thinking. I believe that God hides the answers to the questions we all want answered in higher places so that only eagles can find them and be nourished by them. The problem is that too many of us flounder as chickens rather than fly as eagles. While eagles soar and scan the skies, chickens are busy looking down and eating off the ground. Yes, they do survive from lower-level consumption, but they don’t fly far or do much because they’re too busy pecking at the ground below them. They never move beyond lower thinking into the power of spreading their wings like eagles and flying high. Your mission—should you accept it—is to look up and consider who you are and where you’re going. Will you choose to eat small-kernel thoughts off the ground, or will you seek the mountainous summits of success with those who overcome the giants of life and rise above the storm? As tasty as chicken may be to those who consume it, always remember that chickens mostly eat waste. Their overhead counterparts are too high to consume what was; eagles only eat what is. Life is filled with giants and chickens live in fear of them. Especially with their heads looking down, they could be squashed, decapitated, or destroyed. Their vulnerability is that they remain within the reach of the giants of possible destruction. Giants only fight what they can reach. They only find the treasure that lies in low places. So chickens and those who have chicken ideas are always in the reach of those who seek to destroy them. In my other business of entertainment, chickenlike movies don’t often achieve box office acclaim. More times than not, little investment means little return. Hollywood producers invest the biggest monies into what they believe to be the bigger ideas. The giants of low expectations cause them to underfund chicken entertainment, eat up those drumstick profits, and move on. Though I understand this paradigm, and even have operated on a chicken business level more times out of necessity than preference, I hold in my heart eagle ideas waiting to be unveiled. If you have lived with chickens but thought like an eagle, it is only a matter of time before someone will see the eagle in you and allow you to spread your wings and fly higher. But keep in mind, if you want to go for it as an eagle, you must let go of the chicken’s perspective. Don’t let the giant problems, budget restrictions, or even legitimate excuses deter your dreams and overpower your passions. You may start on the ground, but for God’s sake end up in the air! From the eagle’s view, the giants shrink and become inconsequential. From the eagle’s view, new opportunities are always within sight. The eagle sees what lies before him while the chicken’s view is only what lies beneath him! Eagles never fear giants because they dwell too high to live at risk! Don’t get me wrong—I love chickens and have taken care of them, fed them, and even eaten them. But I don’t write to them! For the closet eagles reading this material, it’s time to spread your wings and lift your vision. We are about to sail far beyond our yesterdays into the cerulean celestials of what lies before us. If forgiveness is a big idea—and it is—then you will need a full set of long wings to rise above the temporal and sail into the transcendent. It’s time to consider what you could attain if you cast off the weight of yesterday and embrace the galling winds of a changed mind and an open heart. My fear is that if we don’t learn to fly as the eagles soar, then we unwittingly set ourselves up to become the burial ground for land mines. Or to use a more powerful, even shocking metaphor, unforgiveness unchecked becomes a cancer in our soul. Just like the fear we all have of discovering a malignancy within our own body, we must learn to be vigilant regarding the grudges we harbor and the offenses we experience. Otherwise, we may never see it coming. We all fear the nightmare of cancer, and you cannot be alive today and not be touched by it, either directly or within your family or by someone you love. It’s the moment when our worst nightmare is unleashed, when a routine physical becomes a terminal diagnosis, or when a small nagging ache belies a much greater problem within. A tumor is discovered or cancer cells are spotted, a polyp or lump emerges from hiding. Far too many people go in for a checkup and are shocked to find that they are in the fourth stage of cancer. Never saw it coming, no warning signs, and no symptoms, just slammed to the floor. It is difficult for them and painful for the family. Seemingly there was no preparation time; it just came out of nowhere. Looking back, it may now seem that carefree days spent basking in the luxurious warmth of the sun became the entry point for the malignant growth of melanoma. While many cancers may not be avoidable, there are some healthy habits that could help many of us live our lives without having to deal with what some call “the battle of a lifetime.” Either through ignorance and lack of education (we certainly never used sunscreen when I was growing up! ), or through the recklessness or carelessness of youth (when we can’t imagine wrinkles and sunspots, let alone shielding our skin to prevent something as ominous as cancer), we failed to do all that we could to ensure our body’s health. And now we’re paying the price through a debilitating battle with a cancer that threatens to diminish our quality of life permanently. I have noticed whenever my wife is scheduled to have a mammogram, her voice will often convey the hidden anxiety she harbors about what such a test might reveal. She will tell me she is about to take that test and there is always a slight quiver in her voice. She has never had cancer, but living with the potential and having witnessed what many friends have gone through gives her some trepidation when she goes in for testing. There is always the potential that some invasion has occurred unbeknownst to her, that she could have cancer and not know it. The older I get, the more I feel the same sense of anxious uncertainty whenever I go in for a checkup or routine medical procedure. While I certainly advocate doing everything humanly possible to prevent cancer and promote early detection, my purpose here is not to alarm you about this disease but to make you aware of its emotional and spiritual equivalent that is just as detrimental and life altering. Our inability or unwillingness to forgive past offenses often festers and metastasizes within us, quietly growing into a blockage that impedes every area of our lives. Unforgiveness can silently lurk in our own hearts as well as the hearts of people we love and remain undetected until it dramatically reveals itself in a crisis or emotional breakdown. When the malignancy of a past wound is revealed, everyone involved feels shocked because they never dreamed that such pain, rage, vitriol, and animosity could exist beneath the surface of this person who continued to make breakfast, celebrate holidays, and buy them roses. If you have lived long enough, you know that it’s virtually impossible to really know all about someone, to see into their hearts and know what’s going on below the surface. Emotional wounds do not always have outward signs of inward turmoil. Most people fail to perform emotional self-examinations, and too often if they do, they ruminate on what they find instead of seeking resolution and healing. Similarly, we fail to conduct routine checks to ensure that the persons we work with or live with are really being open and honest with their feelings. I fear that the busyness of our lives lends itself to assumptions, expectations, and considerations that often allow unresolved issues from our past to multiply into a cancerous growth within our soul. Ignoring the accumulation of wounds, offenses, slights, and injustices that we have endured can lead to an outbreak of serious problems that debilitate relationships and end productivity. Much like the removal of moles and skin lesions is done to prevent them from growing into more serious skin abnormalities, removing minor discord before it becomes a calamity is an important use of our time. Most people don’t like to make waves and they swallow frustration and bury true feelings, not wanting to compromise temporary tranquility, never realizing that massive turmoil doesn’t start out massive—it grows beneath the skin like a cancer that could have been avoided with early detection. My friend, people resign from a job long before they type the letter. Husbands leave before they move out. Children rebel in their hearts before getting arrested for vandalism. We take for granted that if we don’t feel anything or see anything, then everything must be okay. But some of the most lethal killers of our natural health are the silent ones. High blood pressure doesn’t make a sound. Cancer can eat inwardly for months and produce not one symptom outwardly to warn you it has taken root inside the body. This is why everyone should have checkups and regular medical exams. Similarly, this is why we must perform checkups on our emotional and attitudinal health as well as those around us. I don’t mean navel-gazing about why someone hurt your feelings at the church picnic or tossing out a drive-by statement like “how are you doing?” We have to set aside time to really communicate what’s going on inside us and discover what’s really going on inside the other person if we want to foster an atmosphere of health, well-being, and intimacy. Yes, too often we never see it coming. Just as the cancer patient thought of herself as a healthy person prior to the dreaded discovery and diagnosis, we often assume that we are okay as long as we keep up the hectic pace of everyday life. When warning signs emerge in our relationships, our business deals, and our personal friendships, we ignore them or dismiss them as insignificant and unworthy of a more thorough examination. Often people so honor or respect us that they smother discontentment to appear congenial. This kind of deception is often well-meaning but can really rob us of a fighting chance at a better atmosphere at home and at work. Just because a person shows up at work and completes basic assignments doesn’t ensure that they are really fulfilled in the workplace. Just because our kids give us a sweet card on Mother’s Day doesn’t mean that our relationship rivals those on theCosby Show! Just because our spouse sits across from us at dinner and smiles doesn’t mean that our hearts are in sync together. I have seen, time and time again, frustration imitate cancer and silently engulf people who avoid confrontation to the point of becoming martyrs simply because they lack the courage or the skills to be forthcoming about little areas of discontentment and resentment. Before you know it, you have lost a very good staff person to the silent progression of a discontentment that could have been avoided by communicating small things before they became major. Or consider the wife who never realized how restless and dissatisfied her husband had grown in their marriage until an affair was revealed. Many friendships and relationships are often stuck on a treadmill of superficial niceness because neither person is willing to examine their grievances and express their concerns. Forgiveness, as we will explore, requires daily practice rather than the pressure of crisis management. The other insidious danger of not practicing forgiveness is that we become contagious carriers of the very offenses that we ourselves have suffered. If we saw our parents use violence to handle conflict, then that’s how we assume we should handle conflict. If we were betrayed by an untrustworthy partner, then we’re tempted to resort to the same tactics to avoid being betrayed again ourselves. Or consider this: Researchers discovered decades ago that the vast majority of child molesters were themselves sexually abused as children. Now, that’s not to say that everyone who suffered abuse as a child is destined to become an abuser. Some face eating disorders, promiscuity, or other scars like low self-esteem. Not only people suffering with these issues, but also all of us who have had some deeply painful moments of life. Not all rise to that level but inevitably not one of us will live and die without our tear ducts being used along the way. The goal is to protect our future from being infected with the many woes of our past. This is no easy flip-an-emotional-switch kind of process, I realize. So if you are thinking, “If you knew what I’ve been through in my life, then you would understand why I could never forgive the people who hurt me,” please know that I understand the enormous difficulty of your burden. However, I also know that God did not design us to be victims. Even as we experience the selfish, painful, sometimes evil choices of other people, we are not without the same power to choose not to be further molested by the ghost of our hideous experiences. We always have a choice. The tragedy is that so many people become trapped in hell long after their wounds were inflicted. Just as our bodies are designed to heal and recover from our physical injuries, our souls want to help us to recover from the internal wounds that we’ve suffered. Without realizing it, however, we are often the ones holding up the process because we do not have the tools, the role models, the maturity, or the spiritual insight to move forward and allow healing to take place. We have not learned early-detection procedures that would allow us to enjoy a healthier, more balanced quality of life. My hope is that this book will provide you with all of these most vital elements in practicing the art of forgiveness. And please understand that in order to forgive others, we must be willing to look at our own ability to hurt, offend, and injure those around us, often the people we love the most. As we will discover, the Lord’s Prayer provides us with a key insight into how we can experience the joy and abundant life that Jesus told us he came to bring. “Give us this day our daily bread, and forgive us our trespasses as we forgive those who trespass against us,” Jesus taught us to pray (Matthew 6:11–12, KJV). I fear that many people do not realize when they pray this most famous prayer that they are asking God to forgive them in the same way that they themselves are forgiving (or not forgiving) other people! I do not believe God is punishing us in this manner, telling us that basically we’ll receive from him the same thing we’ve been dishing out to others. God is much bigger than that, much more loving, gracious, and compassionate to us his children. No, what I believe Jesus reveals in the Lord’s Prayer is that our human capacity to receive God’s grace is blocked when we are not willing to forgive those who have hurt us. We cannot embrace God’s forgiveness if we are so busy clinging to past wounds and nursing old grudges. In order to move into the blessings of our future, we must relinquish the pains of the past. Forgiveness doesn’t exonerate the one who hurt you nor does it trivialize the depth of your trauma. No, not at all. What it does do is liberate you and your soul from living in the Amityville Horror house of memories and agonies that aren’t worthy of more time in your life. Forgiveness, then, is a gift you must find a way to give yourself regardless of who or what has dropped you into this grievous state of affairs. I earnestly believe that unforgiveness is the leading cause of divorce—not adultery or even economics, which are often touted as the culprits. It has been a sword devastating sisters, mothers, fathers, and countless sons. It has damaged office relationships and undermined the teamwork that increases profit margins and coalesces the best of the best into a business model with higher yields and greater proficiency! So, then, forgiveness is essential if we are to grow into the fullness of who God created us to be. As we are made in his image, we share his capacity to love, to experience betrayal from those we love, and to extend forgiveness and risk loving again. Forgiveness isn’t about weakening you but strengthening you to live again and love again, performing at your highest capacity, unencumbered by yesterday’s maladies. I want to coach you back to your fullest potential and stop the brain drain and agony of a memory gone wild. And help you regain your control as you do have enormous power to change the quality and direction of your own life, away from the path of soul stagnation and bitterness and toward the spiritual healing of grace and peacefulness. Do you really want to experience the fullness of the life you were meant to lead, a life of contented purpose, creative vitality, and joyful intimacy with those you love? Are you willing to let go of the chronic emotional ache from the many blows you’ve experienced in life? Can you sense that now is your season of transition from the old, cracked, and chipped containers of your energy to the joy of new wineskins? Then it’s time to experience the supernatural power that’s unleashed when welet it go!